Sales and Marketing Alignment Blog from Rod Sloane: "Even Usain Bolt can't run your Sales and Marketing Alignment for you!" "Even Usain Bolt can't run your Sales and Marketing Alignment for you!" Listen, the stats do vary. Now, if you're in marketing you'll say to me show me that stats. But the trends in North America may be different in Europe? If you're in sales, you might respond by saying let's not argue over the maths, interpret them for me and tell me what it means and what I can do about it. Sales Cycles are too long, way too long, aren't they? The Cost on New Client Acquisition is too high, isn't it? Something is rotten in the state of sales and marketing working together. But luckily the Calvary is at hand, all we need to do is to install the latest technology, grab a dashboard and embrace Sales2.0 then we can all reach the new Promised Land of Sales and Marketing Alignment, all reach our targets and go party in Vegas or Blackpool (Blackpool is the UK's version of Vegas, honest!). Technology can save the day for us, can't it? Sales and Marketing Alignment is NOT all about the technology you employ. It's about your people, your language and your culture. Now, don't get me wrong I'm not some sort of Luddite that belittles technology, but it's the icing on the cake not the basic cake mix itself. Let's bake a decent cake first with all those simple ingredients. You do know how to bake a cake don't you? No, neither do I. Now' here's a bigger problem than cake making, this all takes time, people, language, culture and finally adding technology. Even Usain Bolt couldn't get you to the Promised Land in less than 24 months. So, if you are serious about improving the long term sales efficiency and results in your company in the next twelve months. Then, you need to start working on your Sales and Marketing Alignment, this quarter, this month, this frigging week, dude! 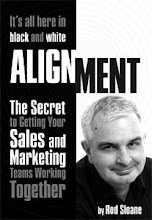 It take time, if you wait till 2011, to start your Sales and Marketing Alignment, then you are not only in danger of getting run over by your competition, but you and your team's earnings well drop and some may even lose their jobs. Start on Sales and Marketing Alignment today!